Apple Stack Cakeâa celebration and a labor of love. 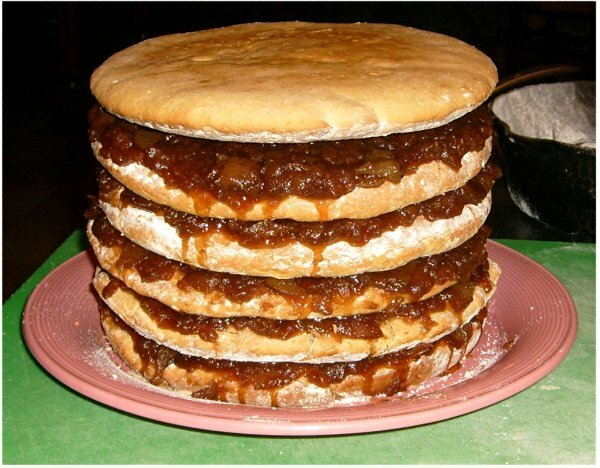 For hundreds of years, mountain families have celebrated weddings and other truly special occasions with Apple Stack Cake. Making this cake is a real labor of love, and many mountain men will reminisce lovingly over how their “Mamaw” would make a stack cake just for them. To make a Stack Cake, home-dried apples are cooked long and slow with sugar to make a thick yet juicy sauce. Using a sweet dough made with molasses and sweet spices, thin, biscuit-like cakes are baked one by one in an iron skillet, to make six or more layers. The cakes are spread with the apples, then covered and allowed to “ripen” for as long as seven days. When it’s ready to cut, the juice and aroma of the apples have permeated the dry cake layers to make a heavenly texture and flavor. In the isolated settler communities of the Smoky Mountains, money was always scarce, and the Stack Cake was often the centerpiece of a wedding. Each family would contribute a layer of cake, made with the costly spices and molasses. The bride’s family would cook the apples and the other families would bring their cakes for the assembly. The number of layers often measured the bride’s popularity, with sometimes as many as twelve layers. Every now and then we make a Stack Cake here at Randall Glen. If you’re lucky, you’ll be here at just the right time to share it with us!